All the species the reserve houses are recovered animals who have been injured in their environment or by animal traffickers. 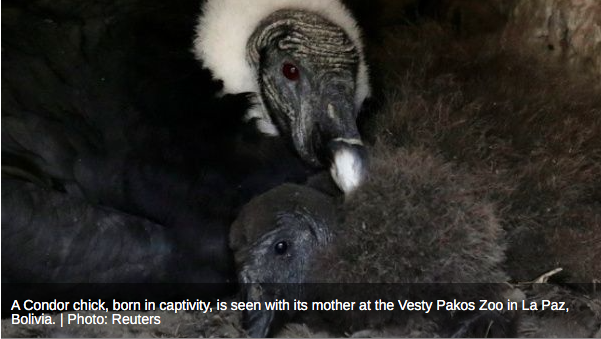 An endangered condor and 14 flamingo chicks were unveiled Monday at Vesty Pakos Zoo, in La Paz, Bolivia. The female condor was named Illimani, in honor of the emblematic mountain of La Paz. It was born on Dec. 20, 2016, and became the first animal of this species to be born in captivity in Bolivia. Zoo director Andrea Morales said she hoped more condors would be born at the zoo in the future. “We were lucky to have a baby condor … The egg was brooded since October of last year and after that, the baby condor was born. Currently, the parents of the baby condor take care of it in the interior of its nest and they have the nest well protected,” said Morales. Illimani was kept from the public until Monday when zookeepers felt it was big and healthy enough to ensure that it will grow to adulthood by year’s end. The zoo also introduced 14 flamingo chicks to the public. The chicks were born after zoo workers recovered eggs in Laguna Colorada, located in the National Reserve of Andean Fauna Eduardo Abaroa, in the highlands of the department of Potosi. Eleven of the flamingos are of the James species and three of the Andean species. “In total, they (zoo biologists) brought about 40 eggs, of which 30 percent were born, which is considered a success,” Rolando Limachi, a zoo veterinarian, told EFE news agency. This reserve does not buy animals, all the species it houses are recovered animals who have been injured in their environment or by animal traffickers. Many are returned to their natural habitat, as part of the native species rescue program. According to the veterinarian, it is the first time in the world that these two species of flamingo have been breed in captivity. “It is delicate because they are born without their parents,” said Limachi and explained that they have been born progressively since Jan. 2, with the oldest being a little more than a month and the smallest a week and a half. He also said that it was interesting to see them adopt the habits of their species, such as staying and sleeping on a single foot and filtering the water of the lagoon to eat the phytoplankton, despite the absence of their parents. This entry was posted in Bolivia, Environment, La Paz, Tourism and tagged environmental awareness, wildlife. Bookmark the permalink.